#FlattenTheDuck: green the grid, and help off-grid users too, with a simple software tweak. So What Tweaks Are Needed? Given Apple's tight control over, and integration of, its hardware and software, there are some simple tweaks that Apple could make to its battery charging controls to effectively add significant chunks of storage to various electricity grids around the world and make them greener and more efficient. Upside: "The electricity grid is under stress. At peak times, it is forced to use its oldest, dirtiest, most expensive power stations to meet demand." (Medium) We have come to flatten the duck. Related adjustments could also help off-grid users of Apple's rechargeable battery-powered devices, such as phones, tablets and laptops. In California, fossil fuel power plants have been complaining that solar panels steal their business during the day, and stop producing when the sun goes down. This happens exactly when everyone gets home and switches on air con, cookers, TVs etc. The shape of the curve is very California-specific, but the problem is similar across the globe. Solar may be part of the answer, storage and demand response the other part. Energy Storage has emerged as a leading solution for smoothing out the duck curve. By absorbing some of the excess energy generated by solar during the daytime and supplying it to building loads or feeding back into the grid in the afternoon and evening, it creates a flatter demand curve that will make it possible to accelerate the acceptance of renewable energy resources. So how can Apple help, at home in sunny CA, and elsewhere in the world? There seems not to be "an app for that" yet, possibly because the right controls are not made available by the operating system. Some slight cleverness injected into its operating systems (and Apple lives by that, yes?) would turn its legions of battery-powered devices into virtual storage helping the grid avoid dirty and expensive fuels and use more renewables, at zero cost. As Upside says "The electricity grid is under stress. At peak times, it is forced to use its oldest, dirtiest, most expensive power stations to meet demand." Furthermore, the grid has to be sized to cope with peak demand, in terms of pylons, generators, etc, building in higher costs that appear on bills and waste embodied energy too. The operating systems (MacOS/iOS) already have a notion of where the machine is in the world from location services, eg used to automatically set the timezone for the clock. From that location (and the season) it is easy to know roughly when peak demand happens, eg winter evenings 4pm to 9pm in the UK, from a built-in database that would be easy to maintain. In many cases it will be possible to work out which grid the machine is likely connected to. And also to discover dynamically over the Internet (when available) when the grid is under stress, eg from tools such as the live display on this site using CO2 intensity as a proxy, or from live stats from organisations such as ENTSO-E for Europe, or the ISOs in the US. Possibly behind a server run by Apple to avoid flinging millions of extra queries at these third-party systems. Other openADR service providers and aggregators may be happy to oblige, being paid to manage this free demand response. Upside itself co-ordinates UPSes (Uninteruptable Power Supplies) for companies' computers to provide exactly this kind of service. Don't attempt to charge the battery beyond (say) 80% (which would possibly prolong battery life too). If possible limit the rate of charge when below that threshold (which would possibly prolong battery life too). Switch on some or all of the energy-saving features as if on battery, such as dimming the screen a little and blanking it sooner. Put a grid-status warning in the menu bar; this could be helpful for uses beyond the device itself! All of this is only needed when the device (laptop, phone, etc) is accepting power from what it thinks is an AC mains adaptor. All of this could be overridden by settings in "Energy Saver" System Preferences "Power Adaptor" panel. Bingo: 1 million laptops deferring 20% of their 50Wh battery charge would defer 10MWh of demand on the grid until it was in better shape. No pain, no cost, can be turned off by the user easily, and unlikely to cause any major pain in any case. Note that even relatively small amounts of storage are valuable both to contribute to a large pool, and depending on how fast that storage can respond. Typical grid managers use a range of services with response times from the order of seconds to hours. The laptop virtual storage pool can be at the faster end of that. Further, see off-grid section below, in may be reasonable to expect to curtail each laptop's peak consumption by 50% by carefully controlling charging, which might be 30W per laptop or 30MW, which represents a chunky expensive emergency diesel generator that does not need to be fired up. This is an initial estimate, for which I would welcome better values for different grid catchment areas. In the UK (for the GB grid) at least one million laptops plugged in to AC mains at times when they could make a difference, with (say) 10Wh deferrable charging/capacity each out of a 50Wh battery (so 20%, eg not charging beyond 80% full when the grid is stressed) for 10MWh of aggregate virtual storage. Worldwide Apple sold more than 5 million Macs in Q1 2017, ie ~20m/year. Only 5% of those have to be in the UK and be in use for at least one year (and typical lifetime is probably several years) to support the above. Gross grid demand in peak hours for (say) the GB grid in winter is of the order of 5h * 45GW = 225GWh, so the 10MWh of virtual storage is clearly in 'balancing' territory, as part of a wider pool of grid services and support. I have a modest off-grid solar PV system with batteries, that supplies some light loads, separate from the grid-tie system on my roof. What I describe would apply just as much to someone living and working off-grid in a solar-powered cabin in the woods or van on the road, etc! In the battery use/charging graph below, just before noon, my Internet connection hardware (eg router) automatically switched off-grid taking ~16W. A little later I plugged my MacBook Air into the off-grid system with the MBA's battery at about 20%. Whoomph! Another 60W from my off-grid system! If the sun had not been out some of that would have had to come from storage, wasting energy in the round trip and eating a little of its cycle life. And 60W is quite hard on various off-grid system components, considering that the average MBA load (see about 16h00) is more like 10--20W. It would be good if we could tell our Apple devices in software to cap their additional charging demand to something like the typical non-charging demand to reduce the stress on upstream devices, or even not charge at all temporarily or unless below some low-water mark such as 80%. These could be advanced controls on the "Energy Saver" System Preferences panel, and indeed overlap with the grid-friendly features mentioned above. The only penalty is a slower charge, but the battery life could well be extended by the more gentle management. One way to achieve some of this may be to use a tool such as NUT (Network UPS Tools) and install a client side on the Mac (eg MacBook Air) that sensibly polls a server indicating when the grid (or local storage) is under strain and reduces power demand (eg blanking the screen sooner). With a little bit of nudging (2018/09/01) I got brew install nut to do something, but it didn't add any UPS controls to the the system "Energy Saver" GUI. This superuser.com item How to Automatically Launch NUT Client at Boot on MacOS seems promising to indicate how to complete setup. Another route may be APCUPSD, though again, simply installing that (without config edits) did not magically make any UPS options appear in the "Energy Saver" control. Though this is not enouraging: "Note: None of these settings are observed on a system with support for an internal battery, such as a laptop. UPS emergency shutdown settings are for desktop and server only." 2018/12/05: Why South Australia energy transition is seen as model of success around the world: see end for "a dynamic chart prepared by the Climate and Energy College team showing the changes in load in South Australia over the last seven years, the infamous 'duck curve' that presents issues in managing the grid, but can probably be handled with some thoughtful planning, some storage, and some demand management." 2018/05/08: British Sun Beats Natural Gas to Provide Most Electricity: "Solar changes wholesale electricity prices in a peculiar way, causing surges at 9 a.m. and 9 p.m. as the sun fades and demand is strong and the grid needs supplies from natural gas and coal plants. Prices plummet in the middle of the day when solar panels deliver their highest yields. The chart below displays a shape that traders in Europe call the "devil horns." In California, it’s known as the "duck curve." It shows the so-called residual demand after taking account of solar supplies." 2018/04/26: The Electricity Industry Is Giving Europe's Power Traders a Headache: "Europe’s power traders have a colorful name for the way the rise of solar power is distorting the electricity industry: devil horns. That’s the shape formed by intraday power prices that increasingly having to adapt to greater flows from solar farms in the middle of the day. 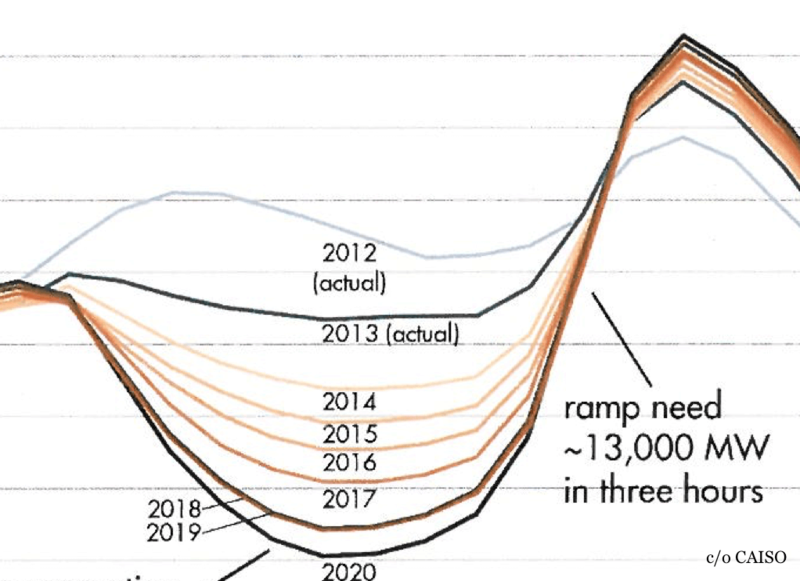 As photovoltaics feed more supplies to the grid, power prices crash and then rise as the sun sets, leaving a distinctive formation in charts ..."
2018/04/06: The Economist looks at the Duck Curve, goes quackers on the metaphors. 2018/02/14: How 'Demand Flexibility' Could Boost Renewables and Save Texas Billions ... and flatten the duck. 2017/10/02: Remember Elon Musk’s big bet on Australia? The clock is ticking: "Elon Musk made a bet that he would install 100MW of batteries on schedule or eat the cost..."
2017/09/27: California system operator CAISO wants to incentivise solar load shifting with energy storage. 2017/08/23: #SolarEclipse and balancing Platts podcast: Eclipse prompted a balancing act by US markets as it curtailed solar power: "As an eclipse cast a shadow across the country Monday, all focus was on power grid operators to see how they handled the sudden loss of solar generation..."
2017/08/18: #SolarEclipse and pseudo-ducks' backs as California ISO Prepares for a Solar Eclipse: "The California ISO estimates that the eclipse will cause a loss of 4.2 GW of utility-scale solar power and projects another 1.4 GW will be lost from rooftop solar generation." Lessons were learned from Germany's experience in 2015. 2017/08/17: #SolarEclipse and storage as 3,000MW of California energy storage will ramp to deal with solar eclipse: "According to the US government’s Energy Information Administration (EIA), 1,900 utility-scale PV plants across the US lie in the eclipse’s path ... Nonetheless, solar irradiance at large-scale PV plants in North Carolina and Georgia, constituting about 4GW of capacity, will be 90% obscured during the event and about 17 solar farms in Oregon will be completely unable to generate at times during the eclipse. As one of the US’ most solar-rich states, California has over 10,000MW installed in the service area of its largest grid operator CAISO (California Independent System Operator), serving between 30% and 40% of CAISO’s total load. During the eclipse, CAISO has estimated that the production capacity of 4,194MW of large-scale solar and 1,365MW of rooftop solar capacity – around 5,559MW in total - will go offline ..."
2017/07/05: Pressed duck: Clipping the curve with energy storage. 2017/06/16: The Australian "Emu Curve" and PV shifting peaks. 2017/04/07: Rising solar generation in California coincides with negative wholesale electricity prices. 2017/03/10: We need electricity to be our flexible friend "... the market would also need to deliver a way of matching supply to demand during those peak hours, at the lowest cost. At least some of that would come through contracts that reduce demand ..."
2012/03: "Mitigating Power Fluctuations from Renewable Energy Sources" assumes ~20 million laptops in the UK connected to the mains. The openADR (Automatic Demand Response) standard and alliance: "an open and standardised language that uses any IP–based communication network to communicate between electricity producers, network operators, aggregators and consumer equipment and devices." Duck Curve - California ISO[PDF]. Tesla kills the duck with big batteries. How to Automatically Launch NUT Client at Boot on MacOS. Why the "duck curve" created by solar power is a problem for utilities. 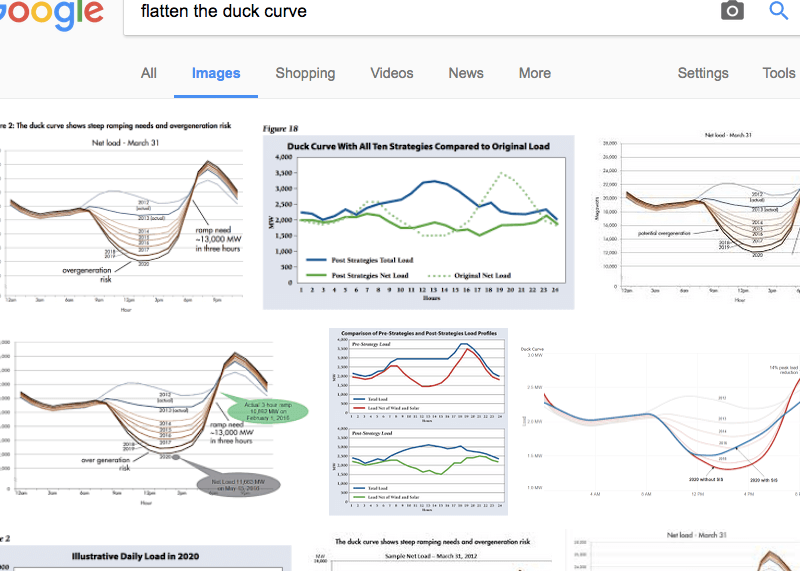 California's Grid Geeks: Flattening the 'duck curve'. We have come to flatten the duck. PV System Performance: Power Clipping aka PV "overbuild". Canonical duck curve c/o CAISO. First published 2017-03-11 , updated 2019-04-18 , rebuilt 2019-04-22 . Site copyright © 2007-2019 Damon Hart-Davis. Hosted by ExNet.